Apart from the large Brighstone Forestry Complex on long term lease to the Forestry Commission, we have seven separate woodlands in-hand, totaling 265 acres. They have been gradually acquired since 1990. The woodlands are all broadleaved in character, although with the exception of Wroxall and Rew Copses, there have been limited conifer plantings over the last 60 years. 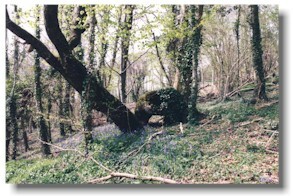 Wroxall and Rew Copses are entirely Ancient Woodland sites, while four of the others have important Ancient Woodland elements. 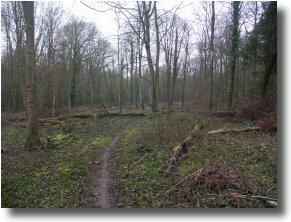 Despite a few indicators and the presence of wych elm, there are no records for the origin of Coombe Plantation, and the wood does not appear in any of the older maps. Wroxall Copse and Rowborough, both of which are important for their veteran trees, were obviously wood-pasture and sheep grazed until WWII. The Brighstone Forestry complex, on a 999 year let to the Forestry Commission, is all less than 80 years old. Woods need management, otherwise they quickly deteriorate and become largely barren of many forms of wildlife. At purchase, our woods had all severely suffered from the 1987 storm and lack of management. Many rides were blocked and impenetrable, and the canopies had closed over, cutting out most of the sunlight. There was a dearth of birds and butterflies. The shade severely suppressing much of the valuable vegetation. Few hazel stools bore nuts and hence there was a shortage of an invaluable food source for both the red squirrel and the dormouse. Now, after several years of conservation-led management, and with the assistance of Forest Enterprise grants, there has been a transformation. The woods are increasingly open to sunlight and there has been a welcome resurgence of woodland flora, including many Ancient Woodland indicators. Silence has been replaced by bird song, and the hazel is fruiting. Butterflies are returning. Due to their importance for veteran trees and wild flora, in 2008 Natural England accepted Wroxall and Rew Copses under our new Higher Level Scheme, thereby increasing funds for maintenance and badly needed capital works. It is, however, a continuing and unrelenting process and it will be at least another decade until the full benefits become apparent. In the meantime, we believe that for its size our woodland estate is the most actively managed for conservation in the south of England. Our core philosophy is to let in more sunlight, - then everything benefits. Existing rides have been widened and scalloped to increase valuable woodland edges. Ideally a ride width should be 1.5 times the height of adjacent trees, but this is not always possible. Our main rides have all been widened, given shape and lead on to the occasional glade. There are regular over-head pinch points for the red squirrel and the dormouse to travel over. Several kilometres of new rides have been created largely for timber extraction or hunt passage purposes. Some are narrower and often damper than the older ones, but all rides bring benefits to wildlife, regardless of whether they are dry or wet, narrow or wide. There is vigorous summer vegetation growth in the damp main rides. Hence they have to be mowed up to three times a year instead of the usual once, otherwise the tall growth would completely deprive the shorter species of badly needed light. Furthermore, with improved woodland edges providing it with more foraging, the red squirrel enjoys the security of small open spaces allowing it to quickly detect and evade any predator. Increasingly our main rides are managed on a two or three tier system. The central strip is regularly mown. The second tier, bordering the centre, consisting of tall grasses and herbs, is cut on a two year rotational basis, and the scrub third tier, (the outer edges) every three to five years. We clean out the spindly, weak and poorly formed trees and remove a proportion of trees to afford more growing space to those retained. About 25% of the stems are thinned each visit. It results in a quality improvement in the remaining stands, permitting their canopies to develop, and allows more sunlight into the lower forest to benefit the under storey, particularly hazel, and the ground vegetation. By this method, we should also be able to encourage natural regeneration and avoid both clear felling and replanting. Skylighting is similar to thinning except we are clearing around the finer specimen trees, giving them more space and light for development. We take great care as to how the operations are carried out. We appoint contractors for their sympathetic understanding of woodlands. Chosen thinning seasons reduce disturbance to the wood’s ecology. Care is taken not to cut down trees containing red squirrel drays (nests) and not to remove conifers used as squirrel food sources. Care is also taken to avoid soil compaction and rutting. No timber is extracted until soil conditions permit and much is left in situ to rot as dead wood. Hazel coppicing is carried out in rotation. It involves cutting wood to ground level and allowing it to reproduce itself by the shoots growing up from the stumps (stools). We coppice hazel on a chequer board basis in areas of half to one acre. There is no ready Island market to accept the better five/seven years’ growth, and there is a growing shortage of coppicing skills. Hence our policy is to rotate at 15-18 instead of 5-7 years. Although less beneficial for the ground flora, birds and invertebrates, it is more helpful to the red squirrel and dormouse, providing good shelter and an improving food source. It is then cut for fire wood. A local hurdle-maker is allowed to "shave" off some of the suitable sticks from the maturing coppice. Timber not used for firewood or processing is left as lying dead wood, naturally breaking up with time. If practical, fallen veteran trees are left lying whole. Dead wood is an important part of conservation management, because it provides good habitats for a whole assemblage of invertebrates, mosses and fungi. It is also visually attractive. If trees die standing, then unless there are safety reasons. They deteriorate as dead wood, giving homes to birds and bats. There is no burning in our woodlands. Brash (i.e. small branches and twigs) is gathered up and rowed into "dead hedges". These might be several feet high and again provide habitats for small woodland mammals, invertebrates and fungi, whilst keeping the browsing mammals away from the new shoots. Veteran trees are a special feature of England’s woodlands, hedges and parks. They are important for biodiversity and add much to the landscape’s visual appeal. They are generally defined as trees in ancient stages of their life, and trees that are old relative to others of the same species. Two of Wight Conservation’s woodlands are important for veteran trees and some 150 exist. They are principally ash, field maple and crab apple. Proper management of veteran trees is important to Wight Conservation, as is identifying trees that might become potential veterans in future centuries. For more on the management and importance of veteran trees click here..
Isle of Wight’s woodlands benefit from the absence of grey squirrels and deer, which, through browsing, could cause immense damage to the country’s woods and the form of individual trees. UKWAS (The UK Woodland Assurance Standard) has been introduced in the last decade. It is a voluntary scheme, largely motivated by some of the bigger stores and some conservationists. It is a wide ranging qualification, subject to audits by independent certification bodies. It embraces silviculture management, planning, conservation, Health & Safety, access, use to the community, community involvement, Trades Union membership etc. It is an expensive process and largely irrelevant to the small woodland owner who finds that its annual cost might well exceed his woodland income. The “carrot” offered by the large stores, such as B&Q, is that they will only buy timber from certified woods. Wight Conservation has decided not to participate but instead formally follows the principles of good silviculture, conservation and Health & Safety. Wroxall Copse can be seen from two bridle paths - one going up a steep hill from north-south through the middle of the wood and the other west-east near the top side. They are particularly attractive when the wild flowers are out in late April and May. At Rowborough, the shooting rights retained by Wight Conservation’s landlord limit our scope to allow access. In our other managed woods, there is only access on an organised or individual permission basis. We believe it is important to leave the woods as quiet as possible to allow the wildlife to flourish. Our own visits are restricted to management purposes and no dogs, except on leads, are allowed. We are managing for wildlife, not people. CLICK for walk details. 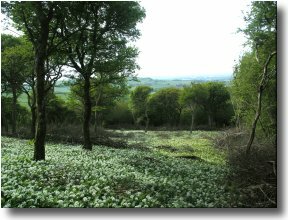 In 2000, Jonathan Cox, a well known freelance ecologist and nature conservation adviser, author of several English Nature publications and consultant to the The People’s Trust for Endangered Species at Briddlesford, gave talk on "Priorities for Woodland Biodiversity on the Isle of Wight" to the Isle of Wight Woodland Forum. It was later published by the Isle of Wight Farm and Woodland Conservation Trust. 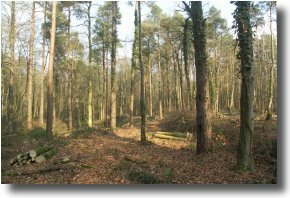 CLICK HERE for a brief history of woodland evolution and development, with special reference to Wight Conservation's own woods.